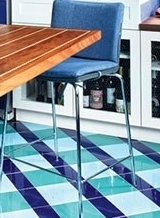 Creative Kitchen Tile Designs . . . Culinary Delights! 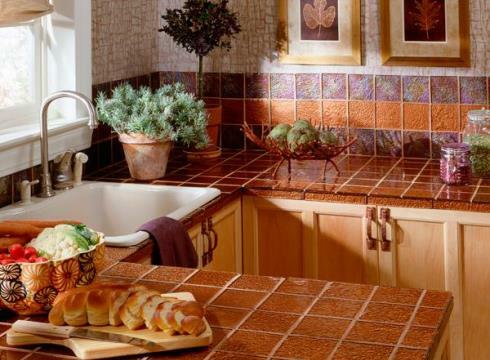 Kitchen tile designs embellish virtually every surface of the most frequented room in today's home. 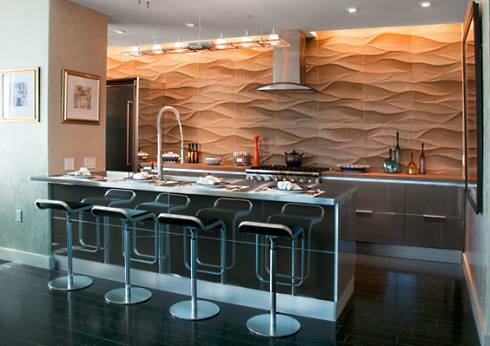 From walls and backsplashes to countertops and floors, each offers a limitless array of design options . 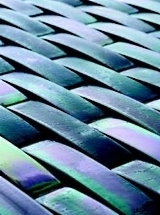 . . and a terrific opportunity to create something uniquely your own! 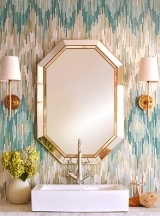 Whether traditional or contemporary in style, there is a tile for every taste. 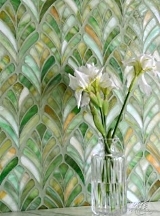 The striking design that follows is from tile maker, Tohickon, based in Erwinna, Pennsyl- vania. 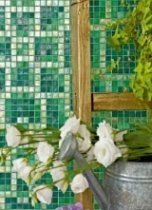 Finely handcrafted from glass, the firm's "New Hope" line is textured on the back of each tile to give it a three-dimensional look, rich in clarity and color. Awash with waves, the California kitchen wall below comes to life with deeply sculpted stone from Artistic Tile's "Hand-Carved" collection, shown here in Ambra Moss Green. 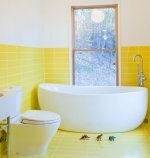 The large, organically patterned tiles are available in two sizes (12x12 and 24x24 inches square). A flowing ceramic tile pattern from ModCraft, based in New York's Hudson River Valley, makes a beautiful kitchen backsplash (below). 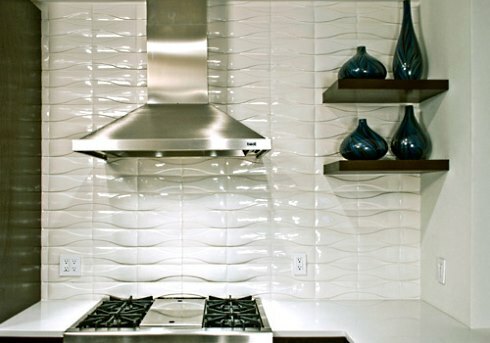 Evoking the waves of the river from which it takes its name, the "Hudson," shown here in white, is a three dimensional tile design that is both modern . . . and timeless. 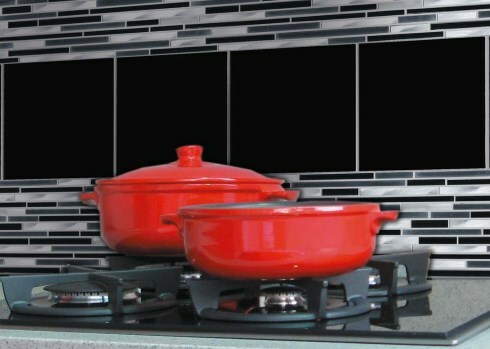 Bands of black and white glass tiles from Florim USA provide a breathtaking backdrop for a cooktop. 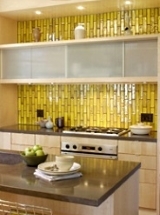 Pictured here in "Glitz Stix," the elegant kitchen backsplash tiles have a luminescent glow. 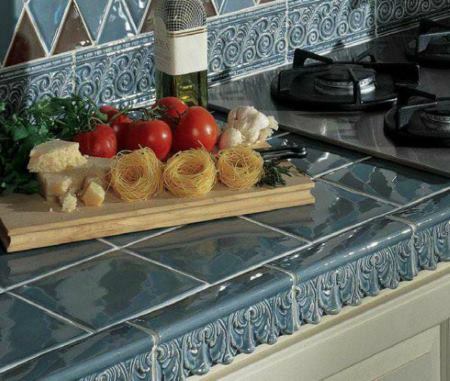 Traditional styling with European flair defines a ceramic kitchen counter tile design from American Olean. The glossy 6 inch square field tiles, shown here in "Smoky Sky," are accented with relief tiles (3 x 7 inches) running along the counter edge. 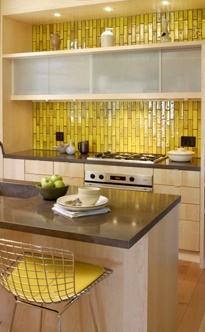 A "random" arrangement of varying sizes and colors lends a contemporary look to the kitchen countertop below. 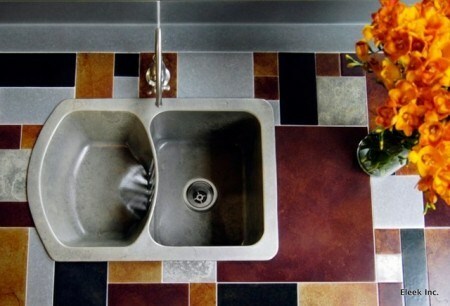 Made by Eleek, based in Portland, Oregon, the tiles are crafted from recycled aluminum and bronze. 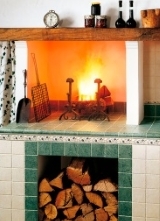 The white hexagon mosaic tile pattern (right), framed by contrasting borders and interspersed with dots, was highly popular in late 19th and early 20th century homes. 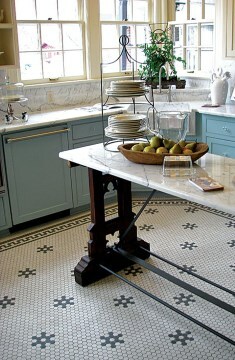 Its timelessness is very much apparent in a relatively recent kitchen flooring installation by Arizona-based American Restoration Tile. 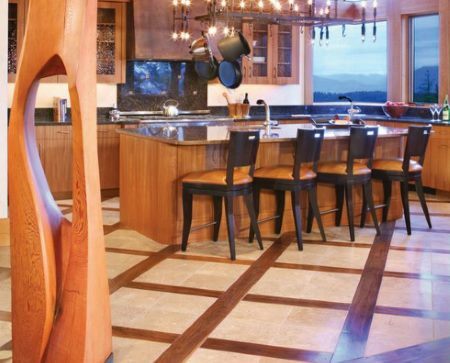 Striking contrasts in color and texture infuse a kitchen floor design by Karlene Hunter Baum of Gabberts Design Studio, based in Edina, Minnesota. 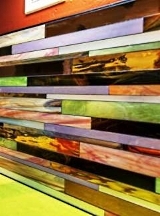 The award-winning designer combined tile and wood with dramatic flair! 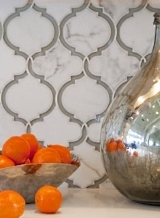 Please check back often or subscribe to our RSS feed, as we frequently add new kitchen tile designs to our site.